The detailed review of Bosch Aquastar 1600 series for residential potable water heating. See the advantages and top features of Bosch tankless hot water heaters 1600H, 1600P and 1600PS, including electrical-independence and hydro-generated gas ignition. 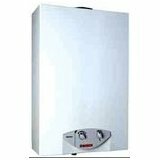 Bosch Aquastar tankless hot water heaters from 1600 series are budget-friendly models that are popular due to its simple design, electrical-independence and some innovative features. Bosch Aquastar 1600H tankless water heaters are the best known for hydro-generated ignition and its independence from the electrical power. As the water flows through the unit, a small turbine is powered by the water flow and it generates enough electricity for the spark and successful ignition. Aquastar 1600H is the wall-mounted model that is not using expensive stainless steel venting but cheaper galvanized pipe. The unit is actually designed for 5" vent size, with type "B" double-wall vents and vertical termination but can use power vent for horizontal venting also. The water heater works in the range from 30,735 to 117,000 Btu for both natural and propane gas, uses the modulating gas valve to control the temperature while it provides the energy efficiency of 80%. Gas control modulates the burner input in response to water flow to reduce temperature fluctuation when the water flow varies. The output water temperature can be adjusted by using the temperature adjustment knob or gas control knob found on the front bottom of the unit. Maximum water flow is 4.3 GPM and that is why Aquastar 1600H is recommended for one application; while the minimum water flow that triggers the unit operation is 0.5 GPM. 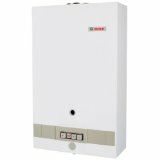 Bosch Aquastar 1600P is the lightweight wall-mounted tankless water heater that utilizes the simplest and most used way of lighting the gas burner - pilot light. It weighs 33 pounds only and with the dimensions of 25 3/4" x 16 3/4" x 8 1/2" it fits almost everywhere. It expels the flue gases through the 5" type "B" double wall vertical vent but you can use the power vent for horizontal venting as the option. With the maximum gas input of 117,000 Btu and water flow rate of 4.3 gallons per minute, it provides an endless hot water for one major application. It is still using modulation to decrease the power to its minimum of 30,735 Btu and save on energy when the hot water flow is reduced to its minimum of 0.5 GPM. Energy efficiency is lower than the previous model, and is 78% for both natural gas and propane. Bosch Aquastar 1600PS is designed as the backup to wood and solar water heaters. It is also built as the tankless gas unit and it is used only when the temperature of hot water produced through the solar heating system is not high enough, so it increases the comfort in your shower. It uses the same features as the above models; stainless steel burner and copper-made heat exchanger and control panel with buttons. This is a very simple unit with the pilot light and modulating gas control valve. 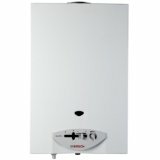 With the minimum gas input of 23,000 Btu Bosch Aquastar 1600PS can work with the lower hot water temperatures, while its maximum gas input of 117,000 and maximum water flow of 4.3 GPM are the same as the above mentioned. All of the above Bosch Aquastar 1600 models come with the 12-year warranty on the heat exchanger and 2 on the parts. According to Bosch, all the above Aquastar tankless hot water heaters provide savings of up to 50% when compare to the conventional tank-type water heaters, and as their energy factor, EF, is less than required 0.82 they are not Energy Star approved. All tankless water heaters from 1600 series are using natural draft for venting but you can buy the power vent kit if planning to do the sidewall horizontal installation. In both cases proper venting, per code, should be provided so the units will have enough fresh air for gas combustion.